Total Heart Support has its roots in Ayurveda-ancient herbal healthcare system of India. According to Ayurveda the balance of 3 energies- Vata, Pitta and Kapha (Kinetic, Thermal and Potential energy) in the body is a disease free state whereas their imbalance causes diseases. The herbs in this product act synergistically to control "Vata" and "Pitta". According to Ayurveda "Vata" and "Pitta" are considered responsible for blood pressure, stress, anxiety and heart problems. Arjuna (Terminalia arjuna): The bark of this tree is used in Ayurveda for prevention and treatment of many heart problems like angina, coronary artery disease, congestive heart failure, high cholesterol and blood pressure. Extensive research has lead to discovery of cardiac glycosides in the bark and naturally occurring Co-Enzyme Q 10, which is really important nutraceutical for proper functioning of heart muscle. 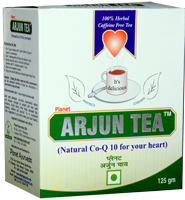 It gives strength to ailing heart and controls the cholesterol levels. Ashwagandha (Withania somnifera): Ashwagandha is also commonly known as 'Indian ginseng'. It is a unique herb with multiple functions. It contains active components like 'Withanolides' and 'Withaferin' which are very beneficial for nervous system. The herbs also possesses anti-inflammatory, antitumor, antistress, antioxidant, immunomodulatory, hemopoietic, and rejuvenating properties. It is especially useful in diabetics and blood pressure people as it also controls diabetes and blood pressure. It relieves stress, anxiety and enhances physical and mental performance naturally. Jatamansi (Nordostachys jatamansi): This herbs is useful in many illnesses like blood pressure and hysteria. It controls epilepsy, mental disorders. It relieves stress and anxiety. Brahmi (Bacopa monnieri): The herb 'Brahmi' is used in Ayurveda since ages for loss in memory, lack of concentration, forgetfulness. It increases the retention power as well as recollection. It is very useful in many mental illnesses also. Regular use also helps in stress, anxiety, blood pressure, hallucinations and epilepsy. Regular use of this herb improves mental ability and cognition. Shankhpushpi (Convolvulus pluricaulis): This beautiful white flowered plant really enhances the mind ability to recollect and remember the things in a very effective manner. It relieves mental stress, controls blood pressure and also improves mind's ability. People in India are using this herb for centuries for their children to improve their memory especially during exams.